During the 2016 National Automobile Dealers Association Trade Show in Las Vegas, Nevada we got a chance to set up a booth (pictured left) to display our great product and get a chance to meet with dealers and people in the automobile industry from all across America. 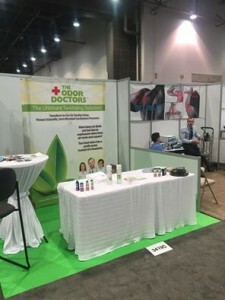 We got to meet some great and passionate people throughout our time at the Trade Show and had the opportunity to showcase The Odor Doctors to the NADA community. We are very proud of the reputation that The Odor Doctors has with the NADA members and that was on full display during the 2016 Trade Show. Whenever we visit dealerships or trade shows, we enjoying sharing our passion and goal to eliminate odors from vehicles in order to improve the customer experience. So if you need stubborn odors removed from your vehicles you know who to call! We’re all looking forward to the next trade show. If you’re a member of the NADA and would like news and updates from The Odor Doctors sign up here. We’re happy to report that things are going so well here at The Odor Doctors that we’re expanding. And with expansion comes new opportunities for employment. We’re looking to hire several local installers across the southeast United States. If you’re anywhere from Boston all the way down to Florida you could have an opportunity working for The Odor Doctors. In order to apply you must have your own car. For more information and instruction on how to apply please contact us. Read our press release from April 22, 2013 regarding our expansion into Canada. Our good customer Daniel MacFadden from Houston, TX dealer Momentum BMW/Mini has recorded a video talking about the advantages of Odor Doctors car sanitizing products.